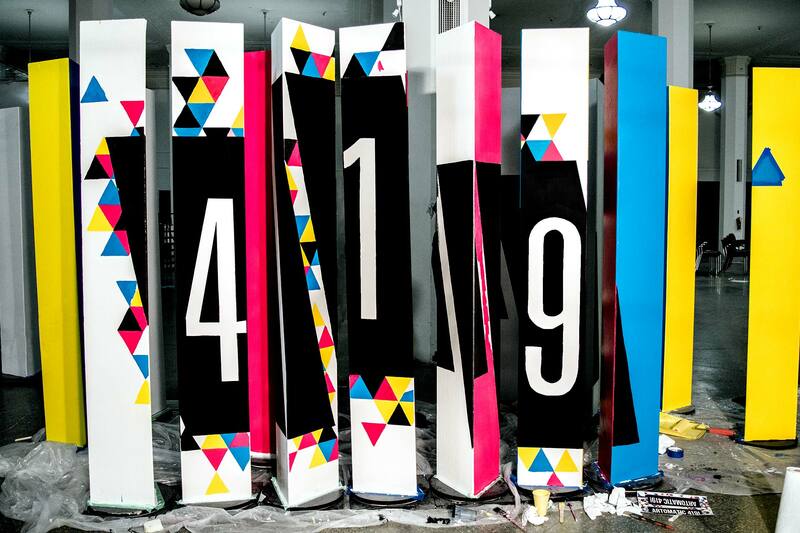 Anamorphic Mural and wayfinding signage. Stewardship by AIGA Toledo. 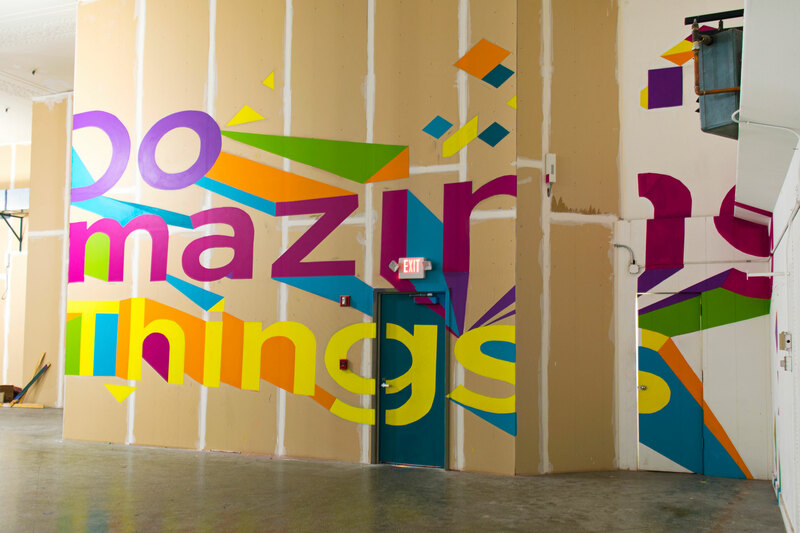 The BGSUGD ARTD3040 Spring class, 2015 partnered with AIGA Toledo to realize a large scale anamorphic type installation. Artomatic419! is a volunteer staffed, bi-annual event put together by The Arts Commision of Toledo. 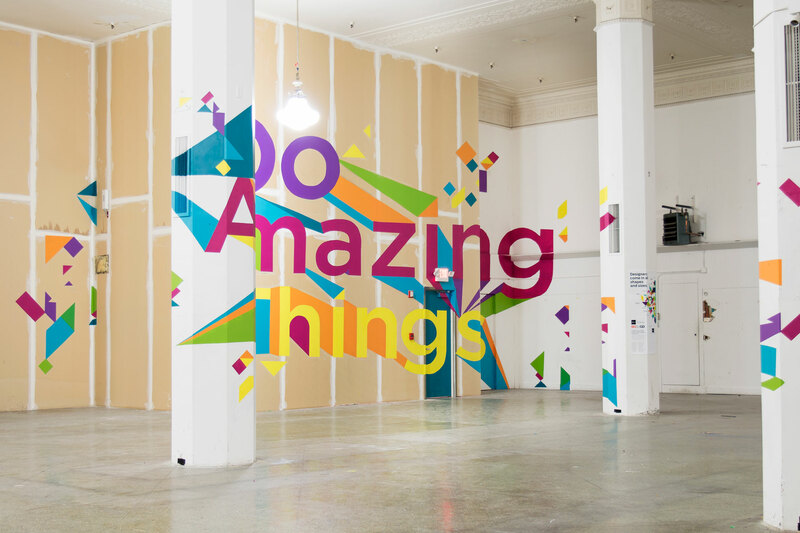 Spanning multiple weekends and featuring hundreds of unjuried pieces of artwork, this colorful extravaganza injects life into forgotten spaces throughout the city. This years event took place in the former Lamson’s Department Store in downtown Toledo, Ohio. 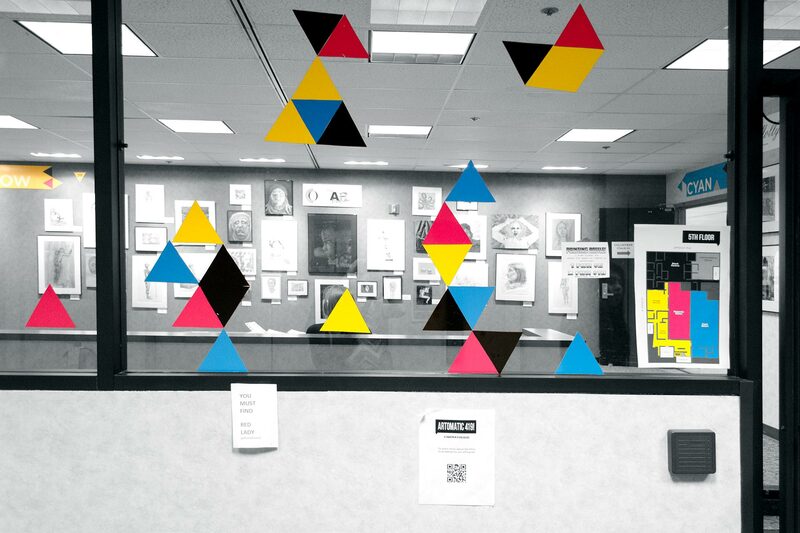 The event branding for Artomatic was developed by the ACT and features a series of modular triangles in CMYK palette. 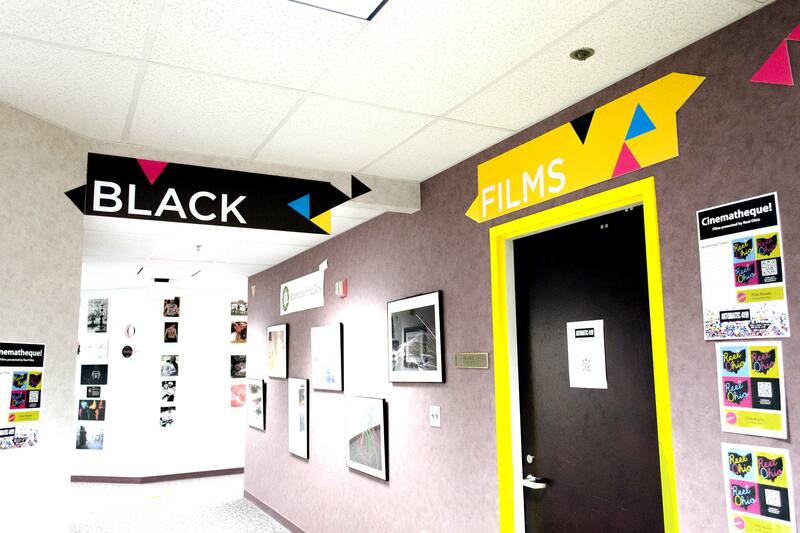 BGSUGD Students were given the opportunity to make use of the building for a mural, but the project quickly evolved into wayfinding and signage for the entire event in collaboration with Asst. Prof Amy Fidler and the board members of AIGA Toledo. 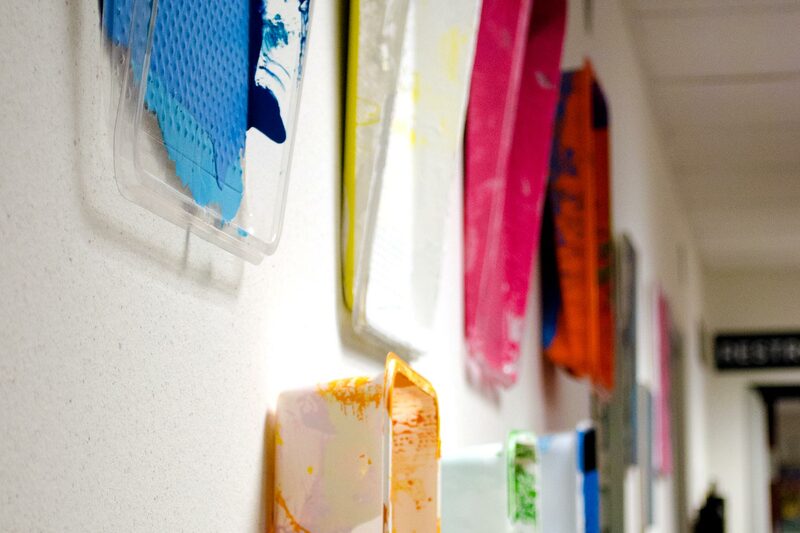 In keeping with the spirit of the event, Artomatic is an unfiltered blast of color and creativity on a raw and unfinished space. The idea to perform a large scale mural approximately 100ft x 150ft was imagined in an interactive, anamorphic treatment. The student body submitted designs with only a few days notice, and the work referenced branding from AIGA national’s motif. Flurries of colored shapes blasting out in many directions. Students submitted work, with Abbie Zbasnik winning final design choice. Students quickly set to work mapping and planning the implementation of this monumental act of design labor. Students moved from design labs at BGSUGD’s beloved Cave lab into the event space and split into groups to divide an conquer. The work was created on the wall with chalk outlines and students scaled three levels of scaffolding (which they also assembled) to trace the work. Assigning numbers in a paint-by0numbers fashion, the Juniors put in hours and hours of work painting, removing guide tape, and repainting edges on what proved to be a challenging surface and working circumstance. Staying late into the night, and having many fun filled pizza parties, the teams shuffled between painting the mural and also designing all the way finding for the event. 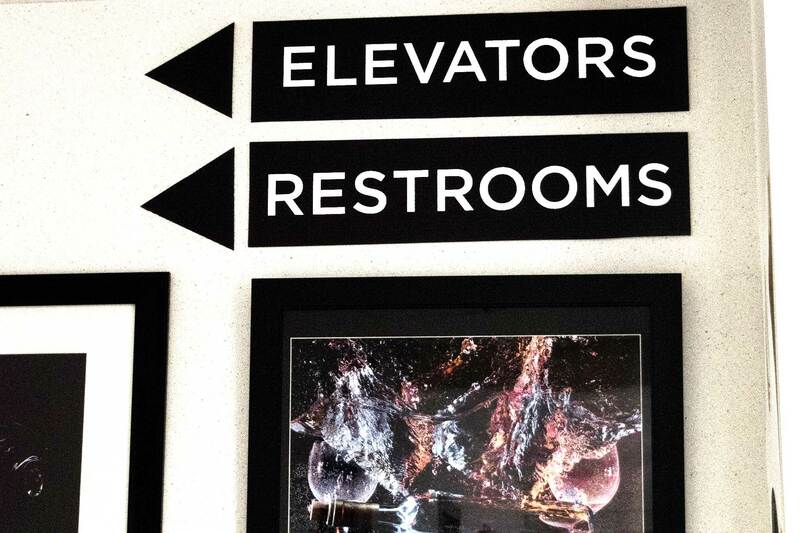 The printed signage for wayfinding needed to conform to specific needs on behalf of the Arts Commission. Donors and sponsors of events had begun to become frustrated every time an event was thrown and they saw a line item expense for signage having paid for things like this for many events prior. Our students developed a simple, functional series of standardized signs for navigation such as bathrooms, elevators, stairs, directional signage, and a slew of color coded numbers that designated artists tables. 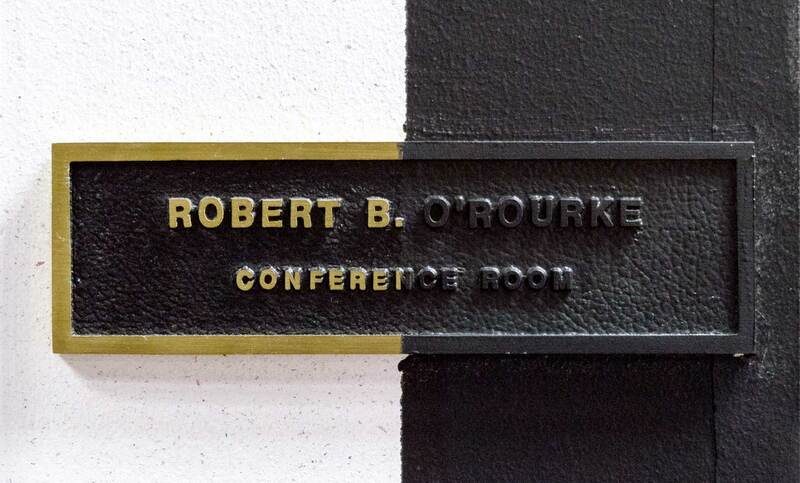 All signage was printed on corrugated plastic and generously donated by Brent Lohman and B-Creative studios. Brent and his team were indispensable in receiving our art files and printing them in high quality form on corrugated plastics as well as delivering finals for students to finish cutting out and assembling. For ongoing events, the Arts Commission now has a cost free signage system that can be deployed with great efficiency and made from sturdy materials. BGSUGD Students then tackled the design and painting of 15 10 foot tall wooden lenticulars that rotated to reveal different sides and styles, all branded for the event with Artomatic Branding. These spinning guides were placed throughout the first floor to announce to attendees and artist where they were in the space, and as aesthetic additions to the music performed by over 80 artists, poets, and bands jam packing three stages on three different floors. All for free, and all 100% volunteer operated. 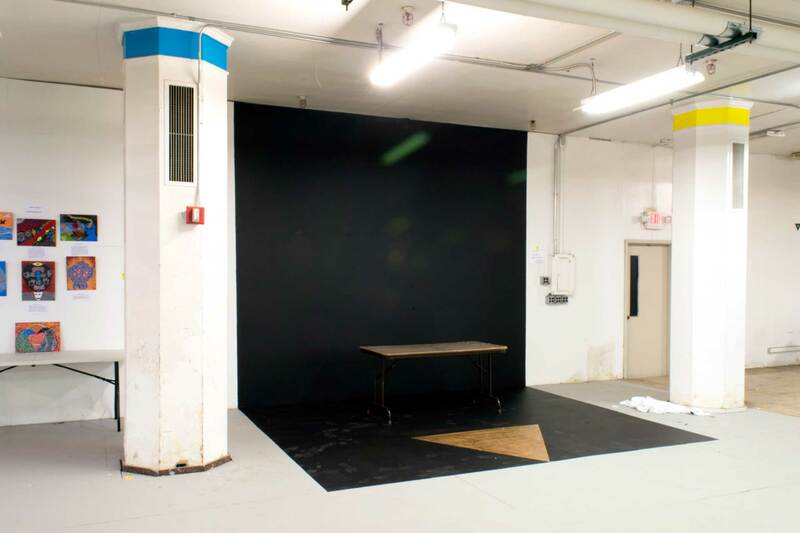 They event painted the downstairs to create a performance black and gold stage. As the mural was progressing, a second team tackled the basement including 20 ft tall pillars to hang signage and paint color coded sections in bands across the top of the pillars. This same act was repeated on the first floor and the fifth floor of the building. Throughout the entire space, navigation was extremely challenging as what was once a series of rented offices and hundreds of doors and walkways had been stripped back to rudimentary materials. Students cut out chunks of carpeting between doorways and painted color coded markers to indicate which section of the floor you were in, broken in to CMYK areas for easier navigation. 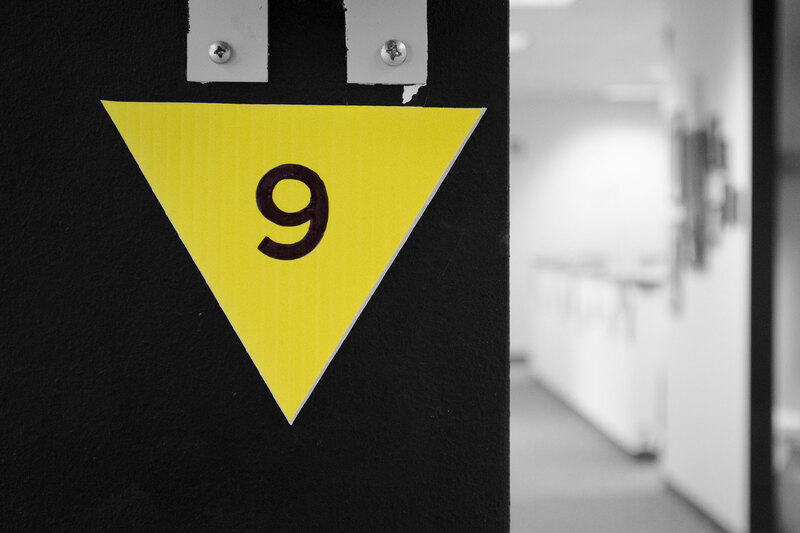 Attendees entering the Yellow area would be greeted by door frames with yellow trim, and floors painting with yellow triangles marking paths. 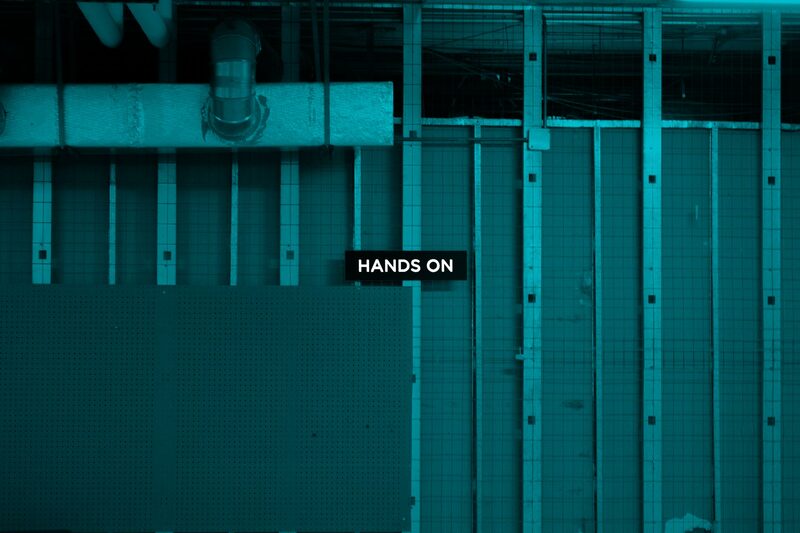 Touch points such as small strips of vertical dividing walls were also painted to subtly reinforce this chaotic environment. While the overall experience was a visually stimulating one with hundreds are artists of various skill levels hanging work on makeshift gallery spaces built from former cubile and office spaces, the signage provided an added level of organization while keeping with the wild makeshift aesthetic of the event. 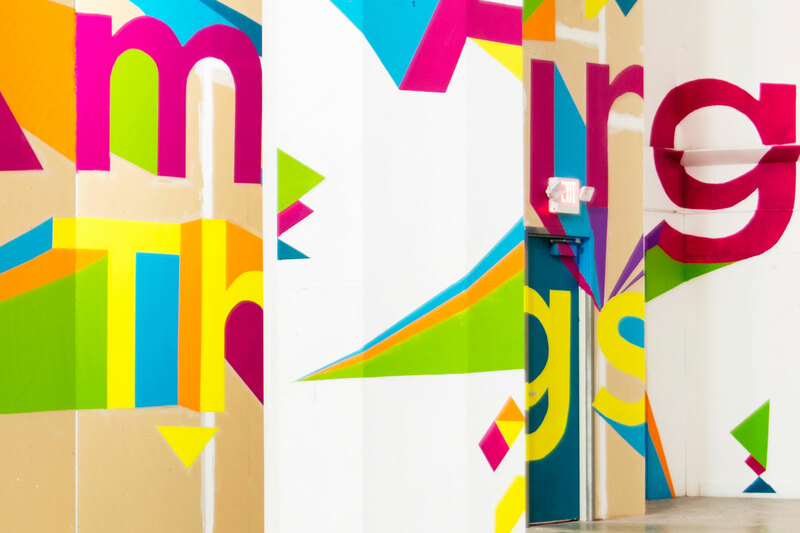 Every aspect of the project revolved around placing emerging designers with established professionals working in the field, and the anamorphic mural & signage was realized with students working alongside professional designers and board members of AIGA Toledo. 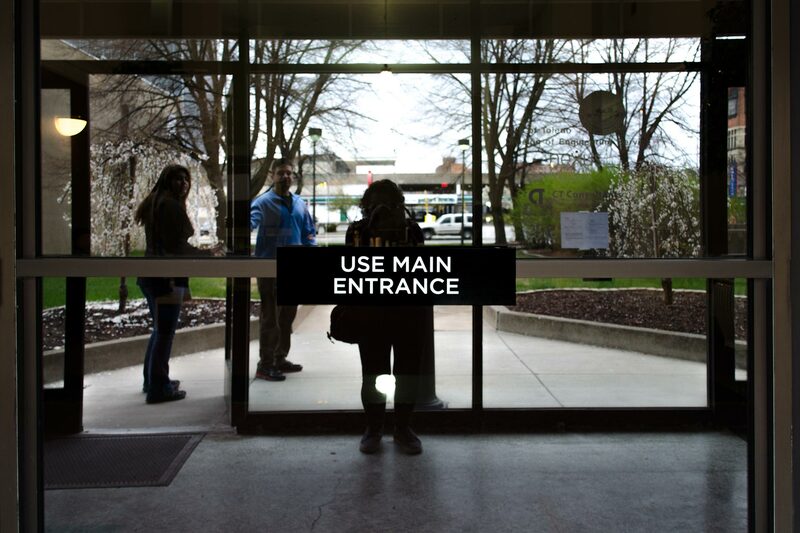 In keeping fully with this flowering of rising talents excited to tackle an empty building, a highschool team was brought in from nearby Whitmer High School design track under the direction and guide of instructor Brian Anderson. These young students took part in the fun, painting walls and hanging signage and hleping to finish the collaborative mural. At the end of the process and under direction from AIGA Toledo president Matt Rowland and instructor Brian Anderson, these High School students were given the opportunity to build a small website that recapped much of the fun and games. A huge thank you to all involved, AIGA Toledo, BGSUGD juniors, Arts Commission of Toledo, Brian Anderson and his students from Whitmer High School, the hundreds of volunteers and thousands of attendees and of course the owners of the Lamson’s building. As part of AIGA’s national branding, “Together We Can Do Amazing Things.” these young designers tackled a huge challenge with gusto and did just that. 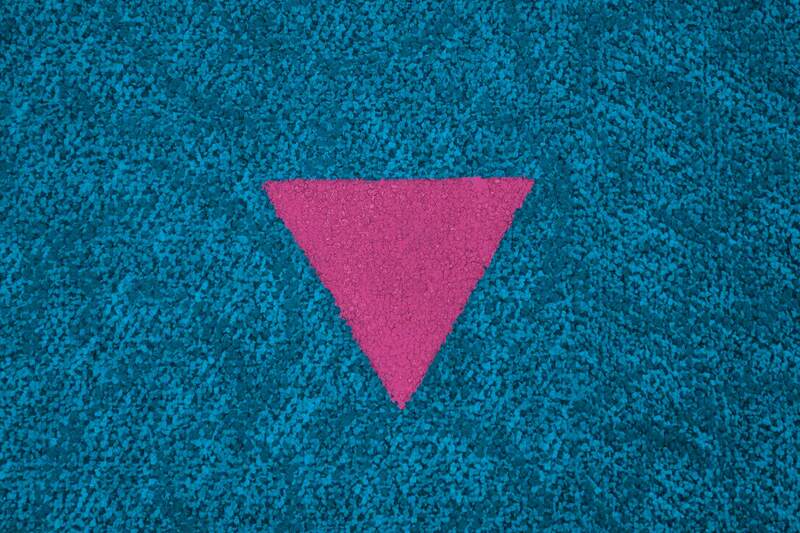 Taking the directive from AIGA’s campaign, they chose to shorten the saying and act on it’s message. 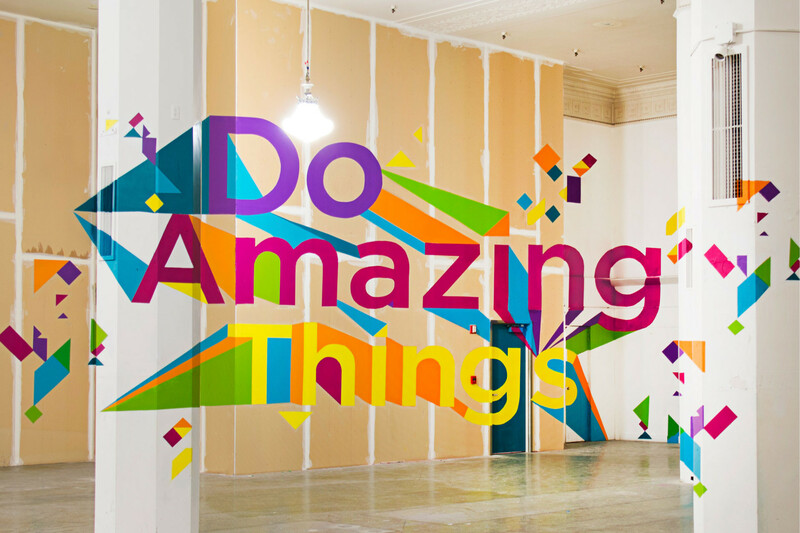 Do Amazing Things. Additionally, Whitmer High School students Pedro Valle, Austin Bodi, Elizabeth Perlowitz, Shalynn Madison, Joy Frantz, and Zach Dawson took part in the painting process under the guide of their instructor Brian Anderson.